For some reason, many people don’t think they are capable of decorating perfect sugar cookies. This is simply untrue. With a little practice and experience ANYONE can create beautiful cookies. Today I’m going to share a fun little tip to help you along on your cookie decorating journey. I used it to make my latest set of Christmas cookies. I call this the impression trick. 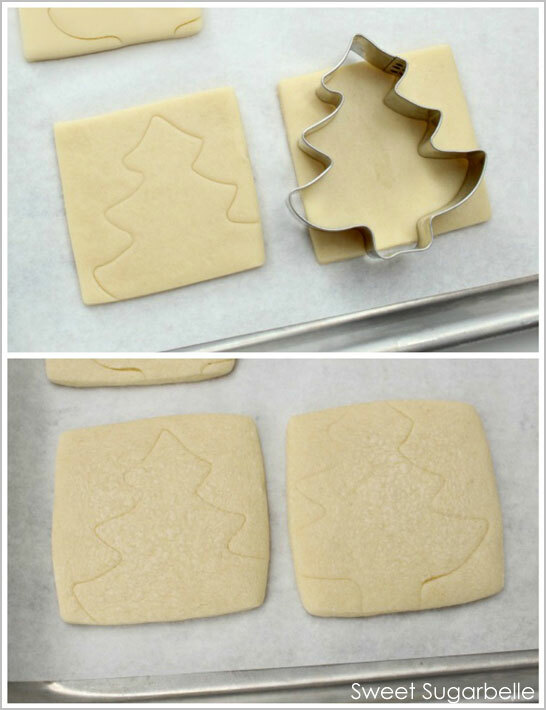 Before baking, I used a cookie cutter to lightly stamp the dough. This leaves an impression on the cookie that will serve as a piping guide after baking . 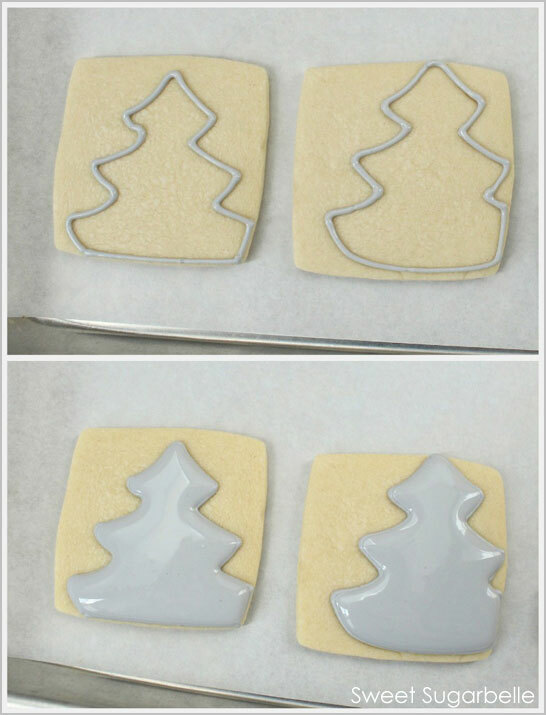 When the cookies have cooled, use piping icing and a #2 or #3 tip to outline the tree design, and after a minute of two of drying, fill with matching flood icing. 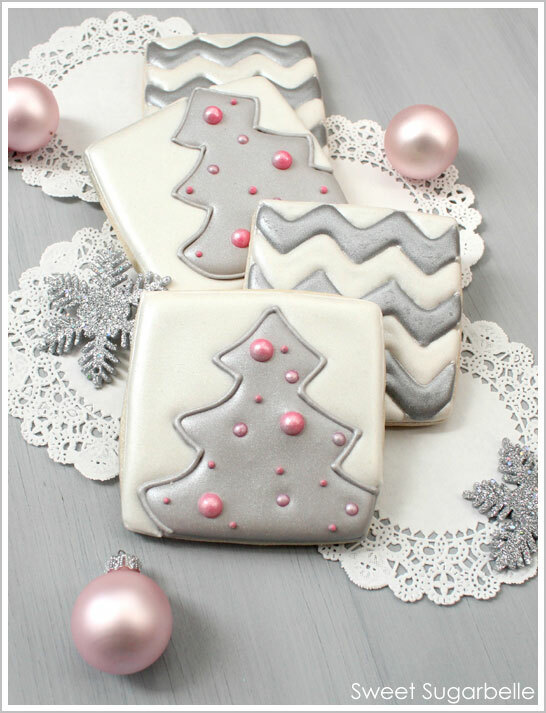 While the tree is still wet, drop colored dragees or pearl “ornaments” into the icing. 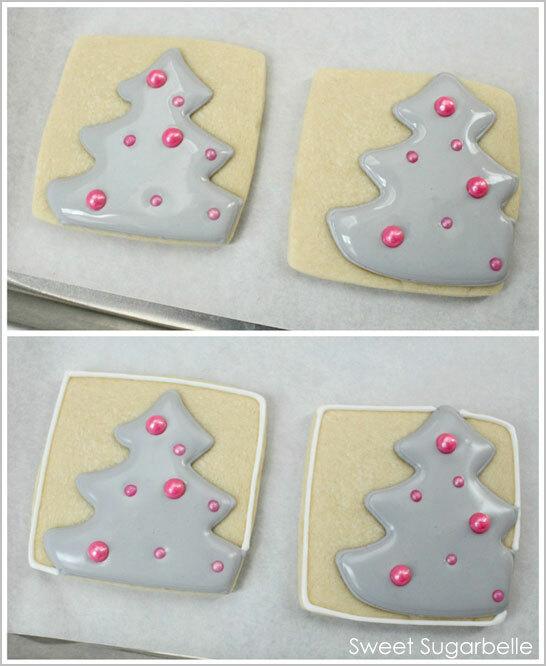 Let the Tree area dry for about an hour, than outline and fill the rest of the cookie. Let them dry overnight, and you’ll have beautiful perfect cookies. Sometimes I’ll use a #1.5 tip to outline the tree or add a few more ornaments the next day. I like to create collections of simple coordinating cookies with lots of texture and visual interest. This makes even the simplest of cookie designs appear amazing. This technique works for MANY different cookie themes. Don’t be afraid to experiment. 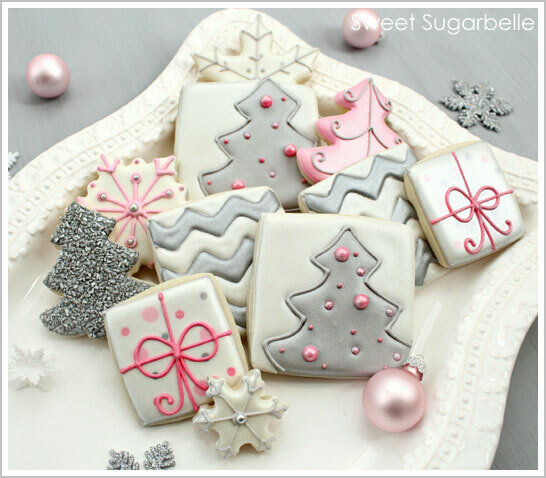 If you have the cookie decorating bug, be sure to swing by my blog, The Sweet Adventures of Sugarbelle, where you’ll find all sorts of cookie how-to’s like the Chevron Patterned Cookies pictured above. Absolutely beautiful!! How do you make that silver colored frosting??? Gorgeous!! Curious how you made the “flood” icing and what type of coloring was used to give the shimmery look to the cookies!! These are Beautiful, with a capital B!! I would also like to know about the silver icing and a source for the silver sprinkles. Thank you for sharing your inspiration and encouragement! LOVE the colors on these cookies!! Pink and gray/silver are the colors for my daughters first birthday party in 12 days…I would LOVE to make the silver shimmery frosting for her cookies. How did you do that??? 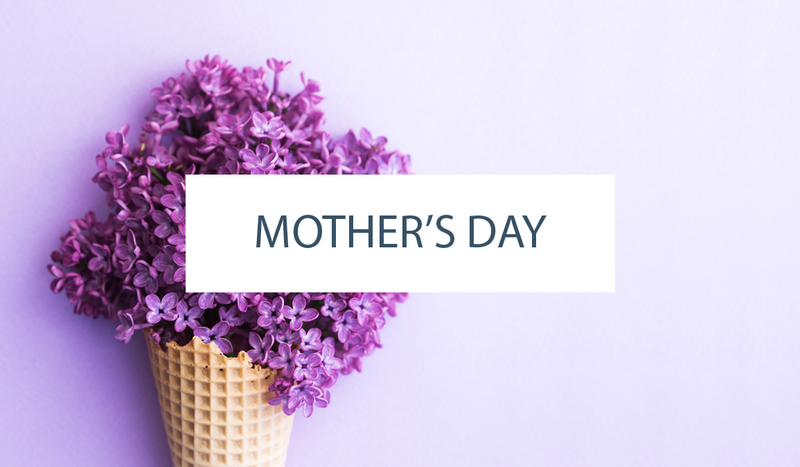 And have you shared your frosting recipes anywhere? Your frosting looks flawless! I can’t wait to try! 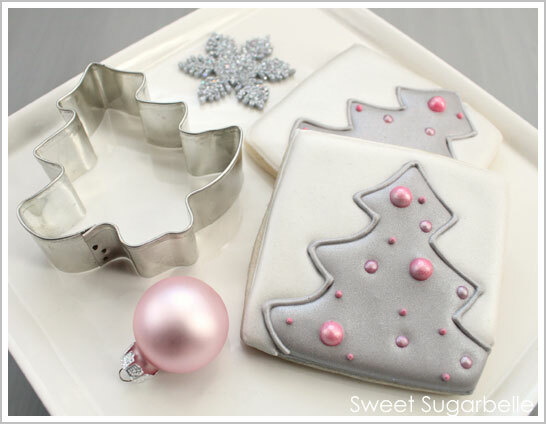 The silver icing is achieved by misting the finished cookies with pearl or silver Wilton lustre spray, OR airbrushing them with pearl sheen if you own and airbrush. As for sprinkles, my favorite resource for dragees is Global Sugar art, and for the coarse silver sugar is Wilton brand and can be found at Michaels or Hobby Lobby. 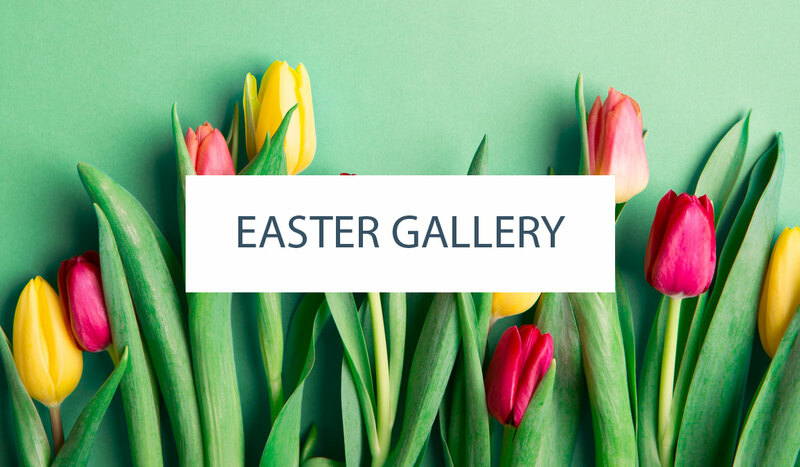 Love the color palette and fun, modern designs. It makes me want to rethink the design of my annual gingerbread house decorating party! These cookies are beautiful. I love what a detailed design you made from such a simple square. Where did you get silver icing from? It’s so pretty. Amazing cookies! Love your blog BTW! I’m all over it right now. I’m always amazed by Callye’s cookies, she blows me away with the incredible detail. These are simply amazing! I’ve always wanted to try this….no more putting this off! I also will have to share this on my blog. Beautiful work!!! Absolutely incredible! I LOVE these sparkly elegant cookies!! Great tip with the impression idea. These cookies are extra special. The colors are just perfect! These cookies are beautiful. After you outline the tree how do you fill in the icing? It looks so smooth, almost like it was poured in. Once again beautiful work. Absolutely beautiful Callye! Can’t wait to try some of these soon. Luster/Pearl makes such a difference. These cookies are beautiful! How do make the cookies that look like presents? The trees are beautiful as well how do you make the grey icing for the trees?